After Birgitta´s death in Rome in 1373 her children Birger and Katarina brought her remains home to Vadstena. There are many stories about miracles that happened along the road. Blind people, who touched the coffin, could see again, and lame could walk. In 1391, on 7 October, Birgitta´s day, Birgitta was canonized. The Pope, Bonaficius IX, officiated the solemn canonization and her name was written in the Golden book of saints. Outside, all the bells of Rome were ringing. Birgitta is the only Swedish saint. Her attributes are the pen, the ink bottle and the revelations. These things are usually to be found on pictures showing Birgitta. The abbey of Vadstena quickly became a well frequented place for pilgrims, because you could purchase indulgences. Indulgences were documents which gave you absolution. If you were afraid to come to hell for something you had done, you could buy indulgences and everything would go back to normal. Also after the trade with indulgences had ceased many pilgrims came to Vadstena to pray near Birgitta´s relics in the abbey. The abbey was very popular. A lot of people wanted to be accepted as monks and nuns. There was usually a long waiting list. The abbey of Vadstena had great treasures and was benefactored by kings and queens even to the age of the king Gustav Vasa. He changed religions in Sweden and wanted to close all the abbeys. The abbey of Vadstena was officially closed in 1595. 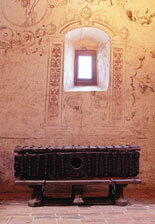 The coffin that took Birgitta home from Rome in 1373 is placed in The King´s palace in Vadstena.